I am looking for a team of “Walkers” to celebrate awareness of heart disease prevention and to raise funds to support the American Heart Association. My team, HeartTrekUSA.com, needs you, your family, friends and dogs to take a short 5K Heart Walk with me near my hometown in Niceville, Florida. Most of you already know my passion for exercise and in particular my Walk across the USA (3,275 miles) last year to support the AHA. I hope to inspire others to lead a healthy lifestyle that includes regular exercise and want you to join me in this effort. *Start by going to the http://www.okaloosawaltonheartwalk.kintera.org website. *CLICK “Find A Team” (far left on screen). *Look through list of teams and CLICK “HeartTrekUSA.com“. *CLICK “Join Our Team” (right side on screen). To my fellow NC bankers…I will be speaking about my Heart Trek adventures with a few slides at the Bank Directors Assembly in Greensboro-Airport Marriott on Tuesday, March 5, 2013; 8:30 am; General Session (Salon D). Be sure to come a little early so we can catch up. Thad Woodard has only given me 15 minutes for my presentation, so don’t be late or you will miss the whole thing. On March 1, 2012, I started on a little walk to promote heart health through regular exercise and to raise funds for heart education and research through the American Heart Association (AHA). This walk, which started at the Cape Hatteras Lighthouse and the Atlantic Ocean and ended on September 2, 2012 at the Santa Monica (CA) Pier and the Pacific Ocean, covered 3,275 miles and included an estimated 5.6 million steps. It was, to say the least, an incredible journey. I was motivated to undertake this trek to celebrate surviving a major heart attack in 2009 followed by open-heart, five bypass surgery. I wanted to share the message that even though some 83 million Americans harbor genetic heart risk, a healthy lifestyle can mitigate that risk and extend one’s life. You can even be vigorously active after a heart attack. Just don’t smoke, eat healthy, watch your weight and get on a regular exercise program—45-60 minutes a day, 4-5 days a week of rigorous exercise. If walking is your choice of exercise, you should be walking at a pace of 100+ steps per minute. With the full support of my family and the partnership with my wife, Brenda, who served as my “pit crew” for this journey, I was able to walk across 11 states and see much of this wonderful country. Along the way, we met so many interesting people and made so many new friends. As examples, we met Evan in Anniston, AL who gave us a donation from his church because “God told him to.” And 90 year old Milton in Jefferson, TX, who, despite a heart operation scheduled the next day, insisted on ringing the historic bell in his church for us (something he had been doing for 76 years). 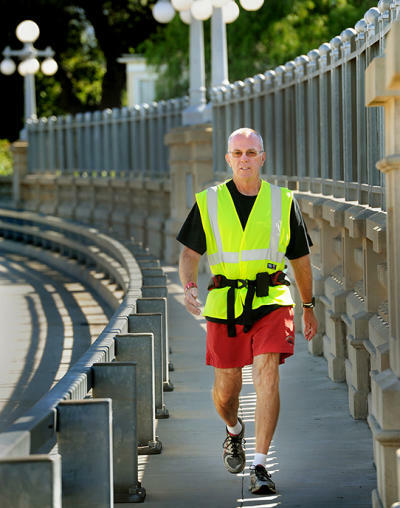 And Dan in Glendora, CA, who is now a marathoner after his beloved policeman father died of a heart attack at age 48. Most gratifying were the numerous people who have informed us that my walk has inspired them to begin or renew exercise programs. As a side benefit, Brenda and I got to see, up-close-and-personal, the varied and beautiful landscape along our path. We crossed farmland and forests, mountains and deserts, small towns and large cities. We were able to take the time to find out what made each place a little special. 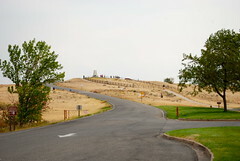 We learned the history of each area and were able to share some of our visions with followers on our website (www.HeartTrekUSA.com). We took over 8,000 photos, many of which were also posted on the website and on Facebook. We gained a lifetime of memories. Many have asked how we were able to do it. It just took a vision, a little determination and a great support team that certainly included family, the AHA and the North Carolina Bankers Association (NCBA). From my perspective, I read a quote recently that seemed to apply directly to me and this journey: “Persistence may be more important in life than either talent or intelligence.” Despite being away from family for half a year and enduring the ups and downs that come with travel (like getting caught in hail storms, 117 degree heat in the Mojave Desert, trekking over 15 degree mountainous trails and avoiding crazy drivers just a couple of feet away), we loved almost every minute of our once in a lifetime trip. All who treated us to a meal, a tank of gas or a fill-up of propane. And especially those who contributed to Heart Trek USA and the American Heart Association. To all, we wish good health, safe journeys and Godspeed. Find your own incredible journey and keep exercising! On our trip back across the country, we visited two iconic locations in a single day. 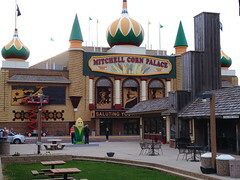 In Mitchell, South Dakota, we started our day at a uniquely American folk art building—the majestic Corn Palace. This building, in its third iteration, has celebrated agriculture and the productivity of the American farmer since 1892. 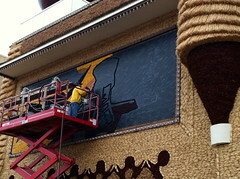 Each year a new decorating theme is chosen and the outside of the Corn Palace is stripped and completely redecorated with new corncobs and grains. Some 3,000 bushels of rye, oat heads and sour dock are tied into bundles and used along with corn to grace the exterior of the building. Roughly 275,000 ears of dried corn in twelve colors are sawed lengthwise and are nailed to the building in elaborate patterns created by local artists. And the building is not a simple box. In each rendition, it has turrets and towers, spires and steeples. It is an amazing structure that is the center of community activity for the prairie of South Dakota, hosting plays, stage shows, concerts, trade shows, even basketball games. Folksy and corny but remarkable and original. 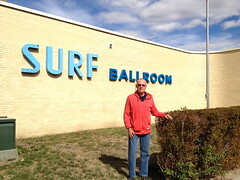 In the afternoon, we rolled into Clear Lake, Iowa to visit the famed Surf Ballroom. Built in 1948, this nostalgic facility has been lovingly maintained in its original glory and splendor. 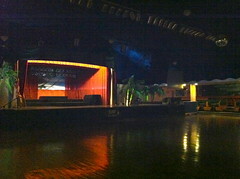 The 30,000 square foot facility has a capacity of 2,100 and includes a 6,300 square foot polished wood dance floor. The ballroom’s name and motif was chosen by the original owner who wanted it to look like a beach club, complete with palm trees, bamboo and rattan and the ambience of a South Seas island. The dance floor is circled by booths that would be at home in any 50’s diner. 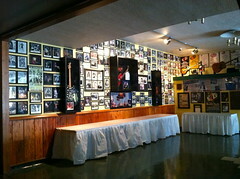 The walls of the Surf are lined with the photos of the countless stars that have appeared in the club from genres of folk, country, jazz, blues, pop, swing, rock and big band music. Names like Count Basie, Duke Ellington, Lawrence Welk, the Everly Brothers, Roy Orbison, Ricky Nelson, Little Richard, Fats Domino, the Drifters, Conway Twitty, George Jones and Willie Nelson. The Surf continues to draw big names in recent years including Santana, BB King, ZZ Top, George Strait and so many others. Even big name comedians like Bill Cosby and Jerry Seinfeld continue to appear here. Brenda and I were honored and awed to stroll around the Surf Ballroom. We were allowed to go into the “green room” where the stars awaited their time on stage. 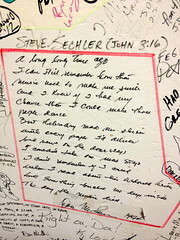 The walls of the green room (which are white) are covered with the autographs of performers including the first verse of American Pie penned and signed by Don McLean. We were also allowed to walk up on the stage for a photo. Thanks to our hostess Margaret for her kindness to some real Buddy Holly fans. Even though the Surf Ballroom is a long way from North Carolina and Florida, we hope to return to this historic venue for a future concert, maybe even the annual celebration of the Winter Dance Party. Please keep following our journey east and south. And don’t forget to join us at the PNC Center in Raleigh at 1:00PM on October 7 for the Triangle Heart Walk. Leaving Yellowstone, we headed east through Montana and Wyoming. 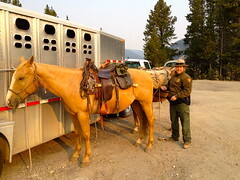 At an early stop in one of the canyons, we met a National Parks Ranger who was saddling a couple of horses. Ranger Donna was preparing to head off by herself into the wilderness to check on hikers. Since I really like horses and adventure, I was little envious of her job. Could get a little lonely though, and this country can be threatening. To emphasize the raw nature of the land, the roads are marked every quarter of mile with stakes that measure snow levels, three and six feet. In southern Montana, we visited a truly historic site—Little Big Horn—the scene of Custer’s Last Stand. On this rise in the plains on June 25-26, 1876, a Seventh Cavalry force of 647 men under the command of George Armstrong Custer faced approximately 1,800 Indians from the Lakota Sioux, Northern Cheyenne and Arapaho tribes. The army was trying to return the tribes to a reservation, while the Indians commanded by Crazy Horse, Sitting Bull and Gall wanted to reclaim their original territory. With a textbook case of arrogant leadership, military mistakes and miscommunication, the Indians won an overwhelming victory. Custer, who was actually a Lt Colonel but had assumed a brevet promotion to Major General, had split his forces and was entrenched with just over 200 men on the high ground. Forces under Majors Reno and Benteen were located some distance away. 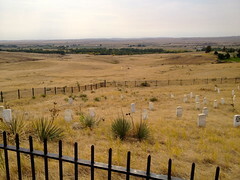 Five of the Seventh Cavalry companies were annihilated including Custer and all the men with him. The casualty count for the US forces was 268 dead and 55 wounded; for the Indians, 136 dead and 168 wounded. It was sobering to see the stone markers where the men had fallen. 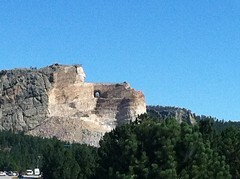 As we eased into northeastern Wyoming and South Dakota, we entered the Black Hills. This area was so-named by the Indians due to the pines that cover the hills and are such a dark green that they look black from a distance. 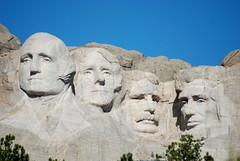 In the Black Hills, we visited two world famous landmarks—Mount Rushmore and the Crazy Horse Memorial. Driving around a curve in the mountains, Mount Rushmore with its sculpted countenances of Presidents Washington, Jefferson, Lincoln and Teddy Roosevelt is pretty amazing. This sculpture was started in 1927 by artist Gutzon Borglund and was basically left in its current state since 1939 when Borglund died and funding dried up. The Crazy Horse Memorial was commissioned by the Oglala Lakota nation in 1948 based on drawings by Borglund with original sculptor Korczk Ziolkowski to honor the Native Americans. It is far from finished with a projected completion date of 2120. If and when it is finished, it would be the largest memorial on earth. Wildlife is plentiful in the Black Hills. We came across pronghorns, antelopes and deer and saw several flocks of wild turkeys. 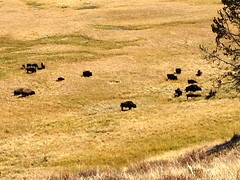 In the Wind Cave National Park, we got really close to a small herd of bison (buffaloes) with an even larger herd grazing in the distance. 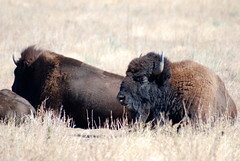 The bison are huge and considered dangerous, but they appear to be docile and even a little lazy. Maybe these particular animals are just too used to gawking tourists. We also did a few drive-thrus of a couple of famous towns in the Black Hills. Sheridan, Wyoming is the hometown of Buffalo Bill Cody. And Deadwood, South Dakota is where Wild Bill Hickok was shot in the back and killed while holding a full house poker hand of aces over eights. Leaving the Black Hills, we entered the Badlands of South Dakota. 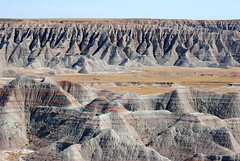 The Badlands were so named by the Indians as a “bad land to cross.” This is an area where soft sedimentary rock has been eroded over time by wind and water into a colorful and unbelievable landscape marked by canyons, ravines, gullies and hoodoos. No two parts of the Badlands are alike, yet each part is remarkable and strangely beautiful in a raw and unique way. Definitely, a must-see part of any trip to the West. We are now headed back to North Carolina with hopes to see other parts of our great country. On our way back to the east coast, Brenda and I were fortunate to spend the better part of two days at Yellowstone National Park. We have wanted to see this premier destination for years. 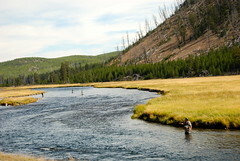 Yellowstone covers almost 3,500 square miles, mostly in Wyoming but with some acreage in Montana and Idaho. 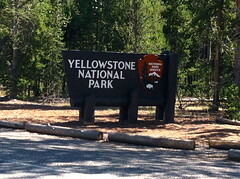 From the RV site in West Yellowstone, Montana, it was less than three miles to the western entrance to the park. Once again, we got in free on our seniors pass. Oh, it’s great to be a senior citizen (occasionally). The park has been occupied by Indians for almost 11,000 years. It was explored by the Lewis and Clark Expedition early in the 18th century, but, with the exception of a few mountain men like Jim Bridger, was not inhabited by white men until the 1860’s. It was one of the first national parks, established in 1872 by President U. S. Grant. The vast park encompasses mountain ranges, valleys, canyons, forests, meadows, rivers and streams. Probably the primary attraction at Yellowstone is the geothermal or hydrothermal activity. The hydrothermal activity is a result of latent volcanic forces under the park. In fact, Yellowstone Lake in the center of the park sits on the Yellowstone Calderon, one of the largest super-volcanoes on earth. With over 10,000 hydrothermal features, Yellowstone has over half of the total in the whole world. 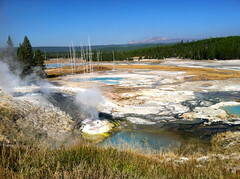 The hydrothermal features include: colorful hot springs with water boiling at an average of 278 degrees; mud pots (acidic hot springs with limited water); paint pots that boil into pools of various pastel shades; geysers (hot springs under tremendous pressure that release periodically); and, fumaroles that emit sulphuric gases and smoke. We visited geyser basins and paint pot fields and drove through beautiful valleys cut with pristine steams where fly fishermen waded at many points. 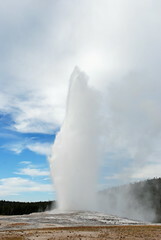 Of course, we had to visit the world famous Old Faithful geyser to wait with others for the eruption of water. For almost 150 years, this geyser has spurted water some 140 feet in the air every 50 to 120 minutes on an average of every 92 minutes. In our case the eruption occurred almost right on time, 94 minutes after the last blast. It was as expected, spectacular, drawing uhs and ahs from the crowd and lasting over two minutes. This is one of the sights that every American should see. It was amazing, however, that the large crowd was made up of so many from other countries. It almost seemed that English was the minority language while we were in Yellowstone. 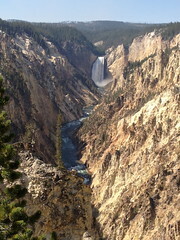 Another outstanding geological feature in the park is the Grand Canyon of the Yellowstone. This truly colorful canyon is bisected by the Yellowstone River which features the fantastic Yellowstone Falls which fall in two parts first 109 feet, then a whopping 308 feet more. From Inspiration Point on the north rim and Artist Point on the south rim, the view of the falls and the canyon is truly breath-taking. The secondary attraction at Yellowstone is the wildlife. 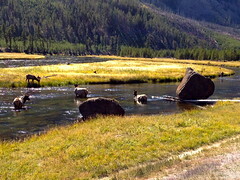 Along the roads, it is common to see elk and mule deer grazing and wading in the streams. They seem totally comfortable with humans stopping and snapping photos. We also saw several lone bison bulls close to the roadside, and in the beautiful Hayden Valley, we came upon a herd of bison with bulls, cows and calves. Zuzu also spotted the “buffaloes” and actually whined at the sight of the “big puppies,” wanting to play with them. We saw what we think was a lone wolf way off in the distance at one point but did not see the grizzly or black bears or cougars that roam the park. Yellowstone is truly a special part of America, and we hope all can visit at some time. We next pack up and head through Wyoming to Deadwood, South Dakota, the Black Hills and the Badlands. Looking forward to getting back to North Carolina by the end of September. Hope to see many of you at the Triangle Heart Walk on October 7 at the PNC Center in Raleigh.